The Infusions range from Feel Good Drinks consists of lightly infused water to give it a gentle flavour using 100% natural ingredients. A new addition to the Feel Good Drinks range are the infusions which sit alongside the other 100% natural still flavoured drinks and also the ones with a few bubbles. Each just contains water and natural flavourings meaning they are only 5 calories per 100ml. So what did we think of the Feel Good Drinks? Well I had a bunch of family and friends around to try them out with me and the lighter infusions range definitely appealed to the females whilst the men preferred the standard still drinks such as Orange & Mango. We all found the drinks to be incredibly refreshing and grown up in flavour with the subtle hints of interesting flavours. Apple & Rose was my favourite with it’s delicate apple flavour and a hint of rose. Best served chilled these flavours are definitely a twist on the usual flavours you see and were a pleasant experience on the palate. Lemon & Elderflower proved one of the most popular combinations in our group of tasters, being a great drink for a Summers afternoon! Have you had a chance to try these out yet? I’ve spotted them in my local Morrison’s but believe they are also available at Asda, Sainsbury’s, Co-op and Waitrose so check them out if you are looking for something light, refreshing with a bit of a twist! Petits Filous Magic Squares are a brand new range with each pot containing two different flavours divided into squares so that you can try a bit of each flavour or mix up and eat both flavours at once. The yoghurt is soft and creamy, coming in two flavour combinations, Strawberry & Vanilla, and Raspberry & Vanilla and is packed full of vitamin D to help build strong bones. The above replies I got to my question about their verdicts, translates to me in both cases, a resounding success. 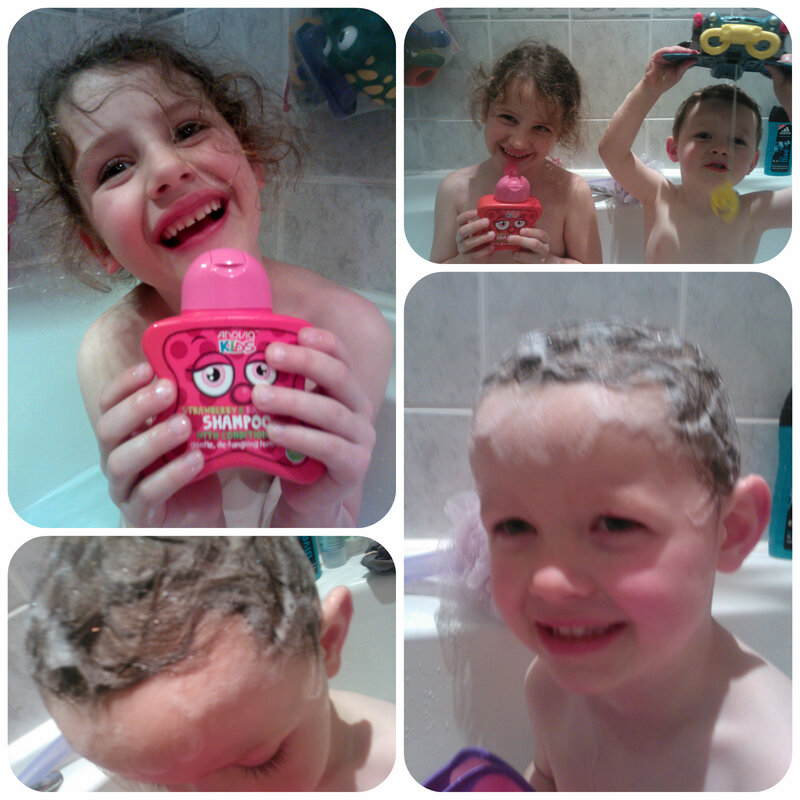 They loved the flavours, they were easy to eat, they enjoyed them and I’ll buy them again! 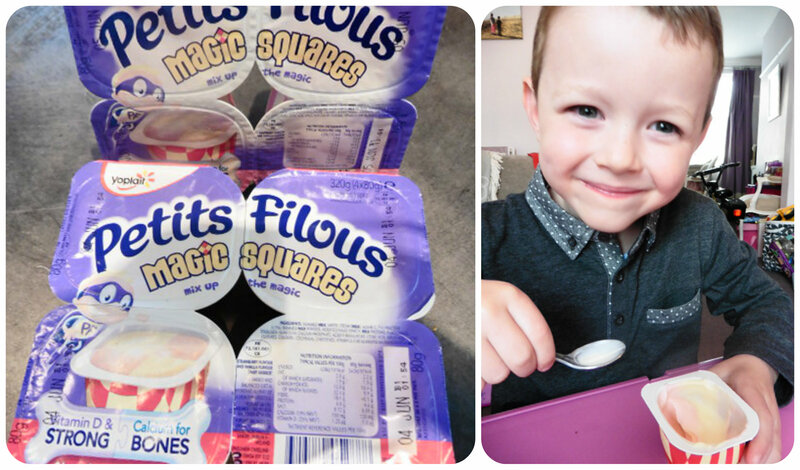 So with Petits Filous mixing up the magic in their new Magic Squares range, what do we do at home to mix up the magic during play. We like to make sure we have lots of different activities planned during the day so that we don’t get bored. With Mister B at home with me all day on a Friday we really try and mix up the magic by changing activity every hour from a bit of craft making, to playing with toy cars, to board game playing, to a bit of gardening if the weather is dry and Mister B’s favourite – some baking in the kitchen. 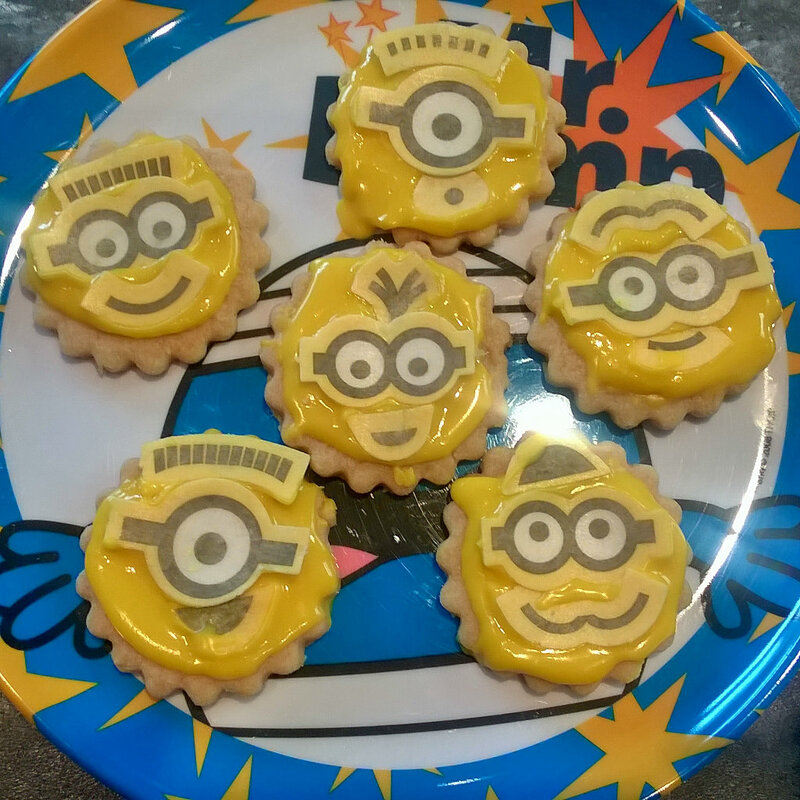 Last week’s cooking activity was biscuits, not just any old biscuits but minion biscuits! Well the excitement on Mister B’s face said it all when he knew what we were doing and he couldn’t wait to get started! He was really keen to get stuck in and do all the baking himself, from mixing, rolling, cutting out, icing, and decorating, until he produced these…. 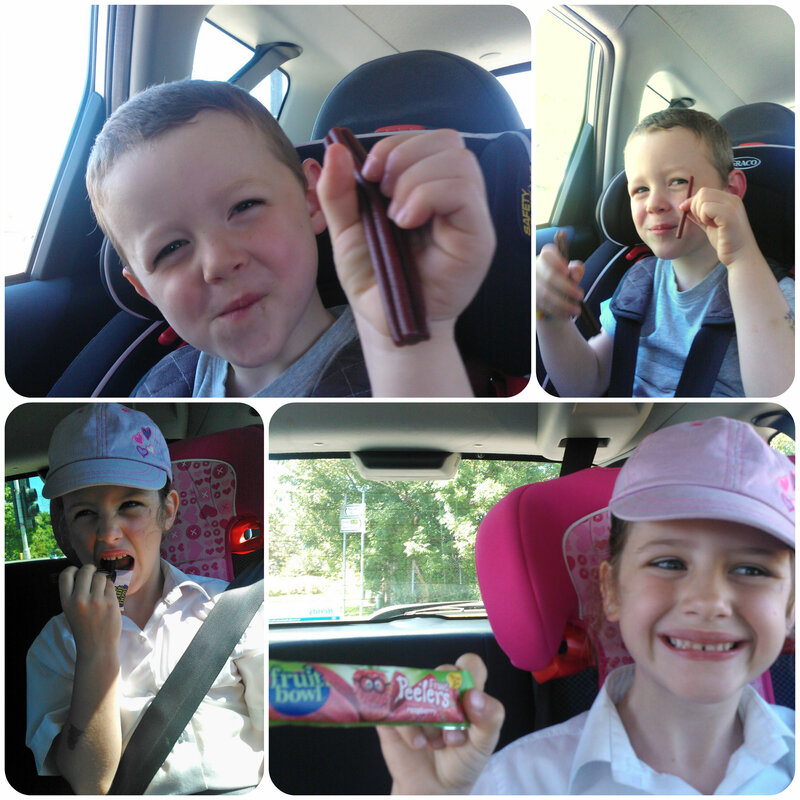 Aw, he was so pleased with his biscuits and couldn’t wait to show his big sister when she finished school! By throwing in different activities we keep the play magic mixed up and the children entertained! 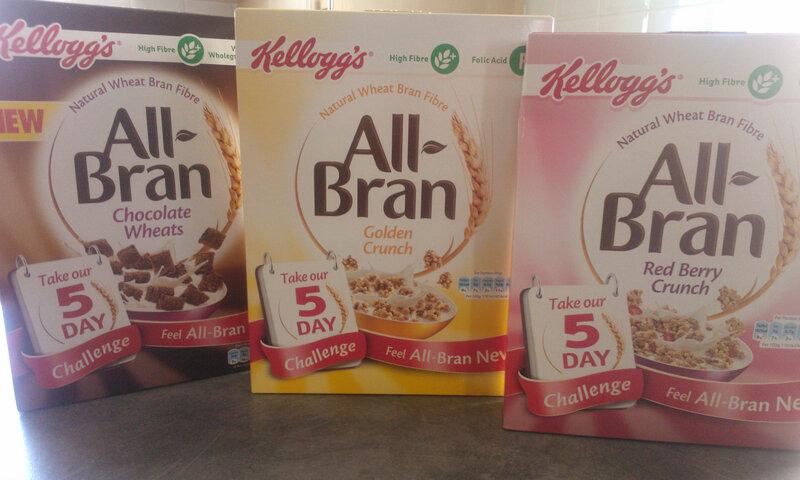 All Bran from Kelloggs have set a Real Mums 5 day challenge to make a difference to your digestive system simply by eating one of the new tasty All Bran varieties each morning for 5 days. The new flavours that we were sent to try are Golden Crunch, Red Berry Crunch and Chocolate Wheats. The children immediately had their eye on the chocolate wheats so I was keen to see whether they enjoyed the cereals too and if it had any effect on their well being at the same time. The cereals really don’t taste like traditional All Bran even though they are full of healthy bran. I really enjoyed the Red Berry Crunch, full of bran, mixed cereal pieces and freeze dried fruit. The Golden Crunch was tasty too, full of multi grain clusters although I did find this a bit sweeter to taste, but great for a suppertime snack. 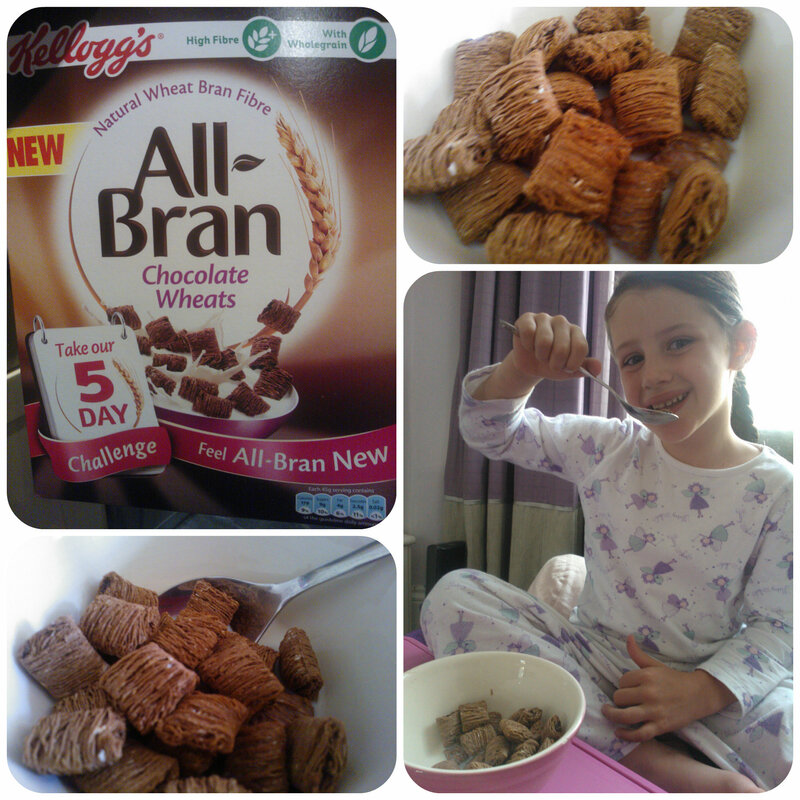 The Chocolate Wheats were really tasty, everyone in the family enjoyed these and the children joined in with the 5 day challenge. Eating healthily is something we always try and do, although we do have treats and sweet things. For me, I do try to have a healthy breakfast although it can sometimes be difficult when in a rush on busy mornings getting the children ready for school. I ensured for my 5 day challenge I had a bowl of All Bran cereal every day and it definitely gives you a good start to the mornings. I do slip up with my eating from time to time and my body does immediately feel sluggish and my digestive system feels the effects with bloating etc. so anything to help me keep on track is good. I do feel a lot better when eating healthily throughout the day and I found that I tended to have more nutrious meals after starting my day with All Bran. Therefore I can say I definitely felt good over the 5 days I ate All Bran. I think starting the day well tends to lead you to carry on the day well. I’m sure my digestive system benefited from eating All Bran based cereal each day and will continue eating it to hopefully build up a healthier digestive flow through my body. Fruit Bowl offer an incredibly appealing range of prepacked snacks aimed at children, with the bonus of being healthy, in fact most of them provide 1 of their 5 a day portions of fruit. 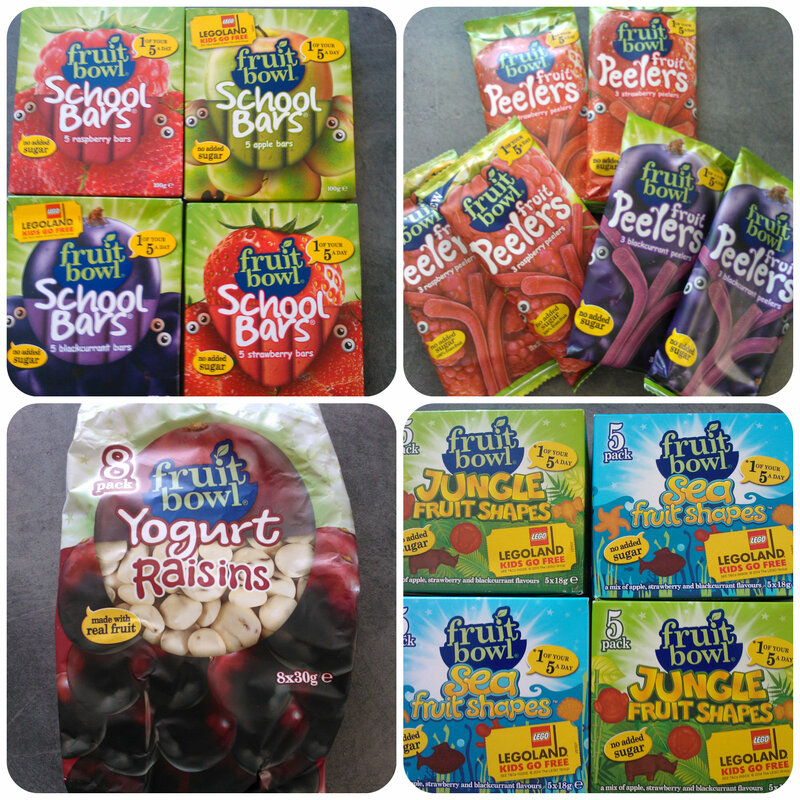 There are various varieties of snacks from fruit shapes, to fruit peelers and fruit bars. There are also yogurt coated fruit pieces although these only count as half of 1 of your 5 a day. My children’s eyes lit up when they saw the selection of snacks we received from Fruit Bowl to try as they do love their snacks and are keen on fruit. The Fruit Bowl Fruit shapes come in jungle or sea varieties and both of these were a big hit with my children. They love eating them and view them as a pack of sweets even though they contain 1 of their 5 a day. Made with apple, pear, strawberry and blackcurrant juices and containing no added sugar, these really are a handy but healthy snack. Their other favourite were the Fruit peelers, which come in strawberry, raspberry and blackcurrant varieties, these are easy to eat and peel down into six thin strips. My children were really keen on these and it’s such an easy way to boost their fruit intake in a day. School Bars are a chunky, fruity bar ideal for pack lunches. My two did find these a little hard to bite and were ok with the strawberry and raspberry flavours but not so keen on the apple and blackcurrant variants. Yogurt Raisins were a big hit with Mister B and he probably could have eaten them endlessly if I’d let him. He loves raisins anyway, so covered in yogurt just makes them extra tasty. Being pre packed, I found Fruit Bowl snacks really handy for when out and about. They are also useful for pack lunches but I found them most invaluable when on days out at the weekend, after school activities and days with Mister B when he’s not at nursery. I can always carry a few packs in my handbag, particularly the shapes and peelers in my children’s cases as these were their preferred options, but being fruit based they couldn’t melt or get crushed. All importantly though, I know that I’ve always got a healthy snack on me for them that I know they’ll enjoy. I’d definitely recommend trying Fruit Bowl if you haven’t already, a healthy option that kids love! All reviews are my own and my family’s opinions and some Fruit Bowl snacks were sent to us in order to write the review. 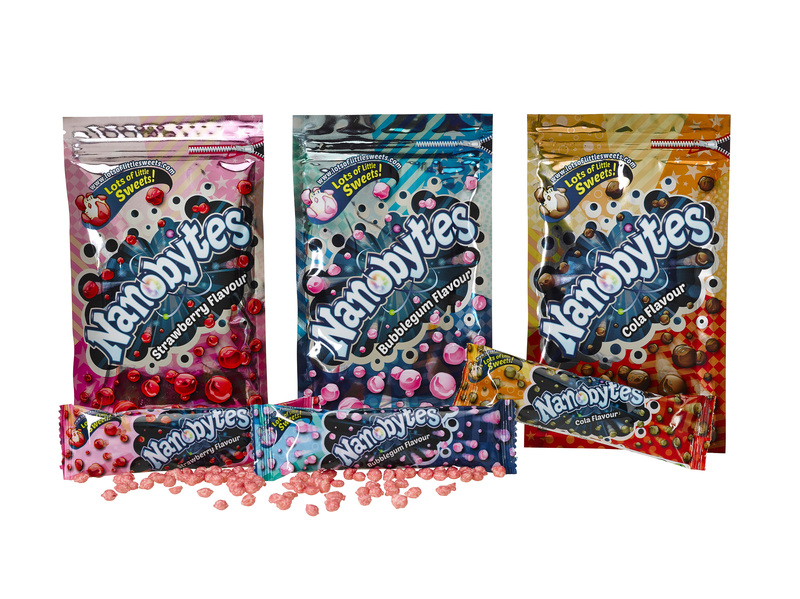 Nanobytes are new Space themed sweets that are small, round and come in a choice of three flavours, Strawberry, BubbleGum and Cola. They are packaged in shiny, eye catching metallic packets that are resealable should you want to save some for another time. The sweets come in a small meteorite like shape and have a crunchy outside shell that breaks to reveal a chewy inside. Each ball gives you quite a strong burst of realistic flavour that is enjoyable without being overbearing. When Miss M came home from school I let her taste test each flavour. Her reaction was “Mmmm, I like these”. The small size was perfect for her to chew. Once she had tried a few of each flavour, I asked her which one was her favourite, and although I thought she’d go for the cola, she replied “Strawberry is the best one but I like them all”. So it’s a thumbs up from Miss M.
Nanobytes will be available not only in the larger resealable bags, but smaller treat sized packs ideal for children. The sweets are all gluten-free, suitable for vegetarians and GMO free which is a bonus making them suitable for more dietary requirements than some sweets on the market. 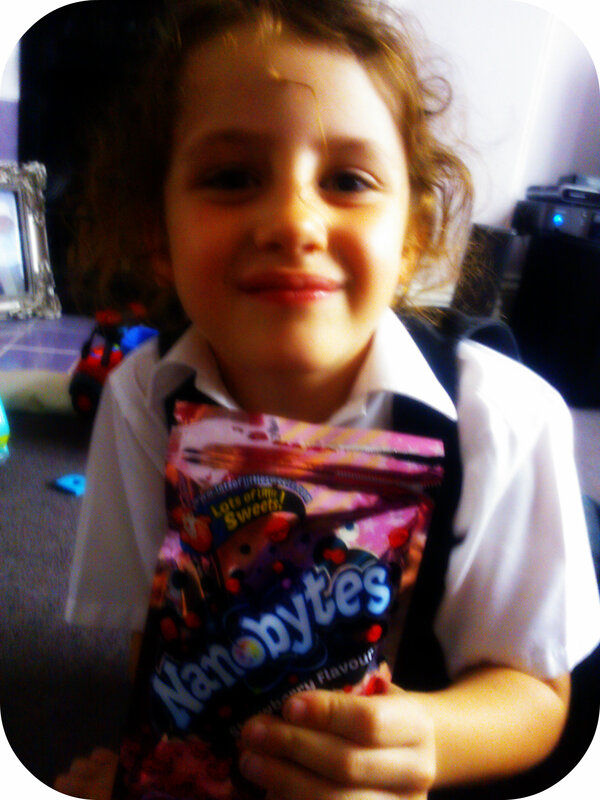 You can find out more about Nanobytes on the new website www.lotsoflittlesweets.com where special online games will be available as well as competition, downloads etc. Also why not follow them on their Facebook page or Twitter feed.